Twenty years ago today, “The Simpsons” debuted on Fox. Its hundreds of episodes since have made it one of the longest-running and most successful shows on television – highly rated and critically acclaimed. Below, an excerpt from Carl Matheson’s essay in The Simpsons and Philosophy: The D’oh! of Homer , exploring whether “The Simpsons” is the heartfelt family comedy it sometimes seems to be. To see what I mean, consider “Scenes from the Class Struggle in Springfield,” an episode from the show’s seventh season. In this episode Marge buys a Coco Chanel suit for $90 at the Outlet Mall. While wearing the suit, she runs into an old high-school classmate. Seeing the designer suit and taking Marge to be one of her kind, the classmate invites Marge to the posh Springfield Glen Country Club. Awed by the gentility at the Club, and in spite of sniping from club members that she always wears the same suit, Marge becomes bent on social climbing. Initially alienated, Homer and Lisa fall in love with the club for its golf-course and stables. However, just as they are about to be inducted into the club, Marge realizes that her newfound obsession with social standing has taken precedence over her family. Thinking that the club also probably doesn’t want them anyway, she and the family walk away. However, unbeknownst to the Simpsons, the club has prepared a lavish welcome party for them, and is terribly put out that they haven’t arrived — Mr. Burns even “pickled the figs for the cake” himself. At first glance, this episode may seem like another case of the show’s reaffirmation of family values: after all, Marge chooses family over status. Furthermore, what could be more hollow than status among a bunch of shallow inhuman snobs? However, the people in the club turn out to be inclusive and fairly affectionate, from golfer Tom Kite who gives Homer advice on his swing despite that fact that Homer has stolen his golf clubs — and shoes — to Mr. Burns, who thanks Homer for exposing his dishonesty at golf. The jaded cynicism that seems to pervade the club is gradually shown to be a mere conversational trope; the club is prepared to welcome the working-class Simpsons with open arms — or has it realized yet that they are working class? Further complicating matters are Marge’s reasons for walking away. First, there is the false dilemma between caring for her family and being welcomed by the club. Why should one choice exclude the other? Second is her belief that the Simpsons just don’t belong to such a club. This belief seems to be based on a classism that the club itself doesn’t have. This episode leaves no stable ground upon which the viewer can rest. It feints at the sanctity of family values and swerves closely to class-determinism, but it doesn’t stay anywhere. Furthermore, upon reflection, none of the “solutions” that it momentarily holds are satisfactory…. Given the crisis of authority, there are no higher purposes to which comedy can be put, such as moral instruction, theological revelation, or showing how the world is. However, comedy can be used to attack anybody at all who thinks that he or she has any sort of handle on the answer to any major question, not to replace the object of the attack with a better way of looking at things, but merely for the pleasure of the attack, or perhaps for the sense of momentary superiority mentioned earlier. The Simpsons revels in the attack. It treats nearly everything as a target, every stereotypical character, every foible, and every institution. It plays games of one-upmanship with its audience members by challenging them to identify the avalanche of allusions it throws down to them. And, as “Scenes from the Class Struggle in Springfield” illustrates, it refrains from taking a position of its own…. I would like to argue that Simpsonian hyper-ironism is not a mask for an underlying moral commitment. Here are three reasons, the first two of which are plausible but probably insufficient. 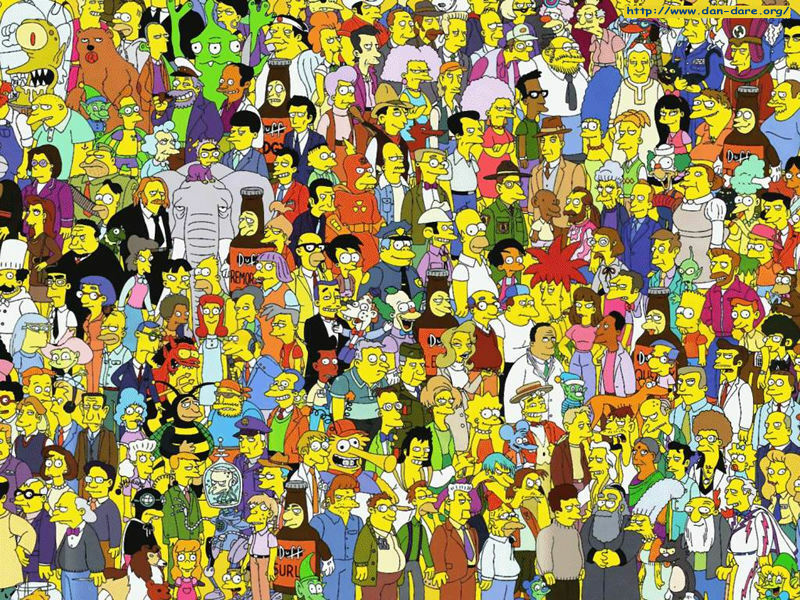 First, The Simpsons does not consist of a single episode, but of over two hundred episodes spread out over more than ten seasons. There is good reason to think that apparent resolutions in one episode are usually undercut by others. In other words, we are cued to respond ironically to one episode, given the cues provided by many other episodes. However, one could argue, that this inter-episodic under-cutting is itself undercut by the show’s frequent use of happy family endings. Second, as a self-consciously hip show, The Simpsons can be taken to be aware of and to embrace what is current. Family values are hardly trendy, so there is little reason to believe that The Simpsons would adopt them whole-heartedly. However, this is weak confirmation at best. As a trendy show, The Simpsons could merely flirt with hyper-irony without fully adopting it. After all, it is hardly hyper-ironic to pledge allegiance to any flag, including the flag of hyper-ironism. Also, in addition to being a self-consciously hip show, it is also a show that must live within the constraints of prime-time American network television. One could argue that these constraints would force The Simpsons towards a commitment to some sort of palatable moral stance. Therefore, we cannot infer that the show is hyper-ironic from the lone premise that it is self-consciously hip. The third and strongest reason for a pervasive hyper-ironism and against the claim that The Simpsons takes a stand in favor of family values is based on the perception that the comedic energy of the show dips significantly whenever moral closure and/or didacticism rise above the surface (e.g. in the Bleeding Gums Murphy episodes). Unlike Buffy the Vampire Slayer, The Simpsons is fundamentally a comedy. Buffy can get away with dropping its ironic stance, because it is an adventure focussed on the timeless battle between good and evil. The Simpsons has nowhere else to go when it stops being funny. Thus, it’s very funny when it celebrates physical cruelty in any given Itchy and Scratchy Show. It’s very funny when it ridicules Krusty and the marketing geniuses who broadcast Itchy and Scratchy. It’s banal, flat, and not funny when it tries to deal seriously with the issue of censorship arising from Itchy and Scratchy. The lifeblood of The Simpsons, and its astonishing achievement, is the pace of cruelty and ridicule that it has managed to sustain for over a decade.